Liban is not that well known but this is probably the fourth I repaired. All of them were Art Deco style watches or smaller dress watches. This one did run but only intermittently. The movement is the AS 1200. The winding stem was also too short so the crown couldn’t be pushed back in enough. As a result, the watch was always in the time setting mode unless you pushed the crown and turned it at the same time. 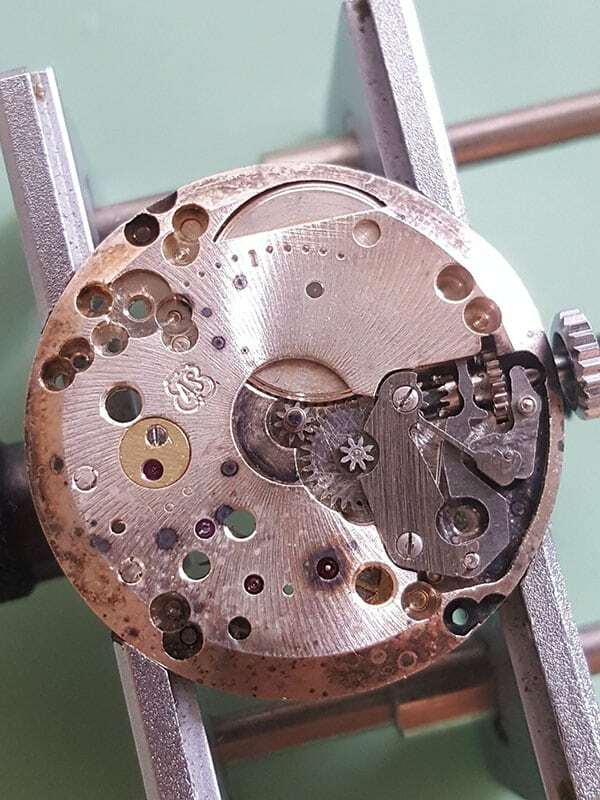 The movement is heavily tarnished and discoloured. I don’t know what would’ve caused this. It’s mainly focussed around pivot holes, bearing jewels and around the edge of the plate. Perhaps someone cleaned it with the wrong kind of cleaning solution. 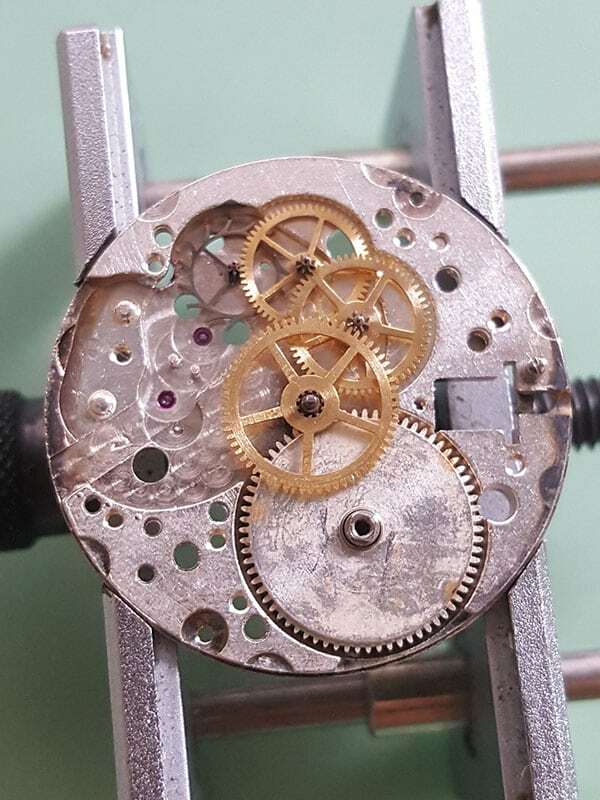 Before you start working on a mechanical movement, make sure to remove all the power from the mainspring. You can use an old oiler or a peg wood to move the click away from the ratchet wheel. I usually use a Ø0.60 screwdriver. Remove the ratchet wheel and the crown wheel (shim was missing) and lift the barrel bridge. At first glance, it looks like the escape wheel has a separate bridge. But if you look closely, you see that both sections of the wheel-train bridge are connected at the edge. I lift the main barrel with a piece of Rodico so it doesn’t accidentally engage the wheel train. You can also remove it after you lifted the wheel train. Lift the center wheel, the 3rd wheel, 4th wheel, and escape wheel. Remove the motion works and the keyless works. I ordered a new spring for the return bar because the old one was heavily oxidized. Don’t forget the shim for the crown wheel. I had to order a new one. I fitted the new spring for the return bar or yoke that I ordered. 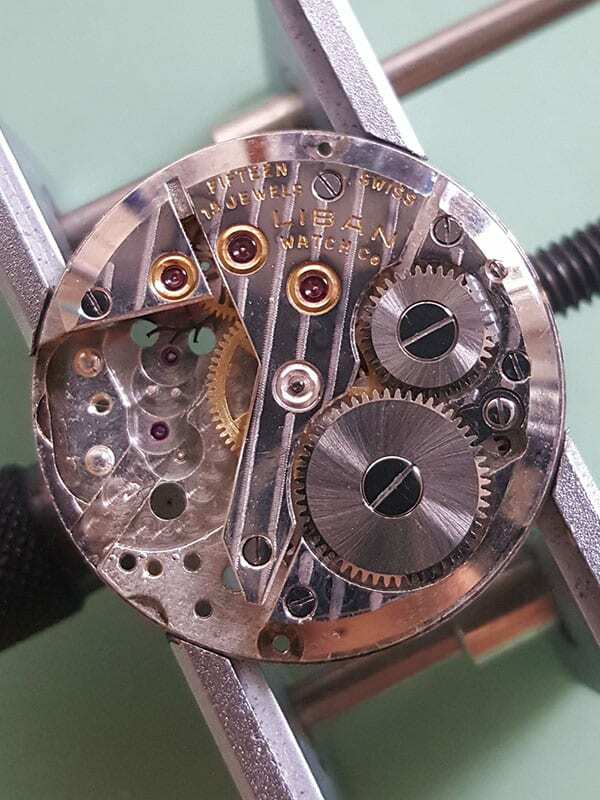 I also fitted a new winding stem and trimmed it to the correct size. What do you think of this Art Deco Liban? Do you have a similar one or another Art Deco watch that you love? Let me know in the comments below.